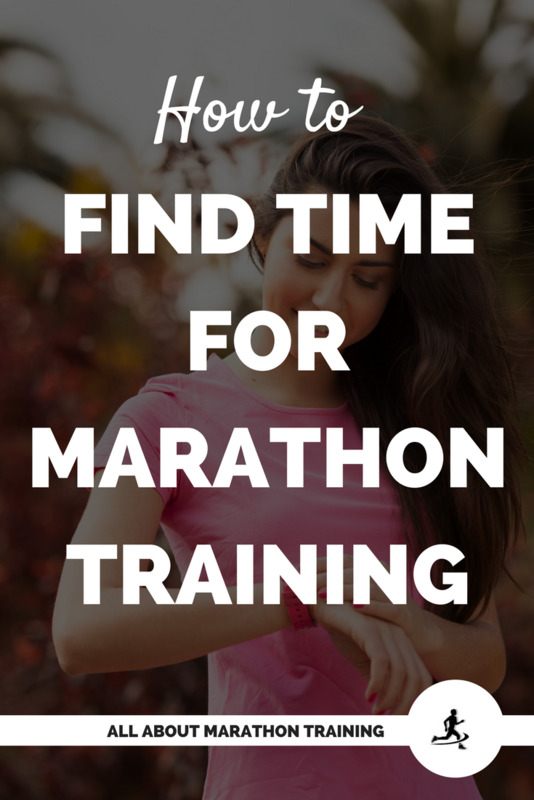 Marathon training can really make your schedule tight. We are all busy. That seems to be the common thread of this day and age. We make time for what we want to make time for. However as humans we are often short sighted and only want that instant gratification of a quick Instagram scroll or that ice cream in the freezer. We say that when we "have time" we'll do this, that and the other thing. We take the path of least resistance. But it’s the small daily actions that turn into the bigger picture of what our life is. It's those every day things that get us to our goals and help us achieve what we want and shape who we are. If we aren't already making time to work towards those goals then how will we ever accomplish them? Do you have a marathon or half marathon on your bucket list? Is it hard for you to find time for marathon training though to weave a run into your weekly schedule? Because if you aren’t running then you aren't meeting going to meet your running related goals. If you find it hard sometimes to prioritize your running then I want to suggest a couple of things! 2. Do a time assessment. It doesn't have to be intense where you account for every minute of your day (although that can really help!) but go over in your head how your typical day usually plays out. Even people with highly flexible jobs there tends to be some routine that they follow. Most importantly, look at how much sleep you are getting. I highly recommend getting about 7 hours (seems to be the sweet spot for most people). Now you need to be conscious about eliminating these. Yes, we all need mental and physical breaks but as a society we tend to chronically take breaks and then talk about how busy we are. There is so much power in 5 minutes. You can actually do a lot in 5 minutes or at least accomplish a quick task if that's all you have. The key is to be vigilant and realize "Hey I only have 5 minutes but I can unload the dishwasher in that time." Check. Now how does doing a time assessment help you get your run in? Seeing where you are wasting your time and overindulging shows you where you can actually squeeze in that hour to run (half hour run + half hour for cooling down and taking a shower). If you are getting 7 hours of sleep that means that you can go to be at 10:30 and wake up at 5:30 for a beautiful early morning run and then shower. Or even go to bed at 11:30 and wake up at 6:30 for a run. Starting your day off with a run will not only wake you up and make you feel good but also will help you to be more productive throughout the day and will keep your healthy goals forefront in your mind. 3. Plan your week out. I usually like to take some time on Sunday night (or do it on Friday evening for the coming week as Laura suggests in her TED talk) to look over the upcoming week, see what I have plans for, if there are any days where my schedule will be thrown off from the norm, etc. Then pick those 3 things that you want to accomplish by the end of the week. (Maybe run 4x, clean the garage out, and have some friends over for dinner). Make sure they are priorities so that if those are all that you can get done this week (besides work and those regular every day happenings) you will consider it a success. Often times we over plan and then we find ourselves discouraged because we don't accomplish that much. The key is to simplify and prioritize! So do just that and you will feel much more productive and actually will get a lot more done while still having time to run! 4. Plan your top 5 things you want to get done this month. Just like planning your week out, plan your goals for the month at the end of every month. Prioritize and choose what you really want to see happen in your life. Maybe it really is time to buckle down, find a training plan and start marathon training or half marathon training. Or maybe this month really is not the time to actually start a program because of x,y,z. Whatever the reason, taking that time to really look at your coming schedule, set some goals and get some insight into what you want this next month to look like will again help you be more productive and realistic with your goal setting as a runner. If you are planning on tackling a huge goal like "Start training for a marathon" break it down into more manageable steps - find a marathon training plan (first week of the month), find a race (second week of the month), learn more about how to eat and fuel yourself to be able to finish that marathon successfully (third week of the month), start your training plan (fourth week of the month). By the end of the month (which goes by sooooo fast) you will feel like you are actually going somewhere! 5. Write down your goals and be specific. The key to this is being specific. Don't just say, "I want to run a marathon" but say WHY you want to run it - e.g. "I want to run a marathon because in doing so I will prove to myself that I can live a healthy lifestyle that includes a regular routine of exercise while challenging myself to accomplish something that I know will only make me happier and more confident." It needs to be powerful enough so that when you read it you will say, "YES! This is why I am making time to run. This is why it is a priority for me to run and fit it into my busy life." Then tape it up somewhere where you can see daily and it will hold you accountable. Start Running! Run 30' without Stopping! 6 Week Half Marathon Challenge - get to that finish line in no time! 20 Weeks to Your FIRST Marathon - this is our ultimate marathon training guide for those wanting to run their very first marathon! 32 Week Marathon training plan - by far our most popular marathon training schedule! Our 7 Finishing Time Goal Marathon Training Plans - from breaking 3:30 to crossing the finish line in under 5 hours!